Note from Lynn: I've been an admirer of Samantha's ever since she launched Wyoming Women Rise, a nonprofit that is working to get more women into elected office. When I saw that she had started working with WyoFile (one of my must-read sources of news), I chased her down for a post. When my mom gave me advice in preadolescence to keep a journal, it would take me several years to realize that she had given me the gift of therapy that would prove to be my own personal time capsule. 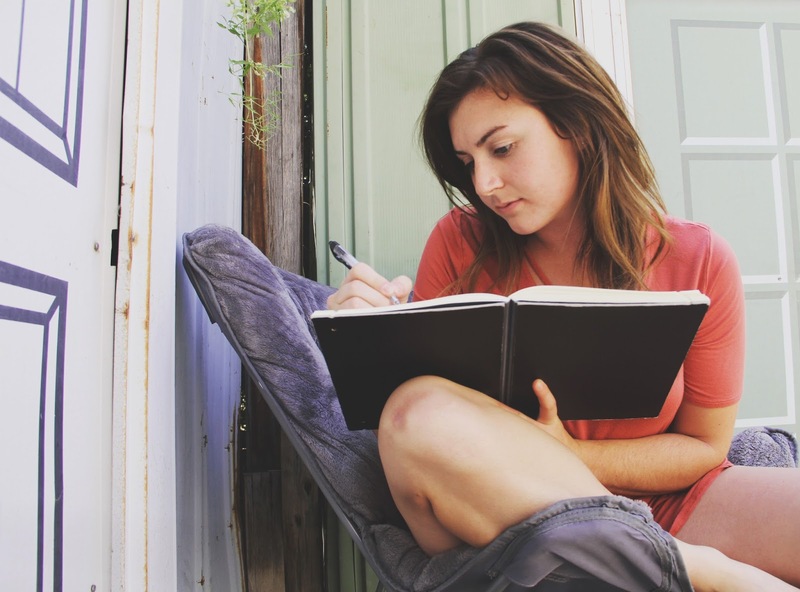 My early days of journaling were primarily motivated by a desire to document the day’s events: who kissed who in 7th grade, a friend and I getting into a fight one day, how outrageous my parents were acting the next day, and other thoughts that occupy a teenage mind. It’s entertaining to read now, but I know in the moment it was relieving to translate my thoughts and emotions into symbols on a page and not have to worry about the consequences of storing unfiltered words somewhere other than my mind. As I passed through several more years of life, what I wrote about began to morph in really profound ways. Instead of writing about the latest thirteen-year-old gossip, my mind began to grapple with thought-provoking questions like my purpose, the meaning of life and observations I had of the world around issues like privilege, oppression and suffering. I wrote about how earth’s seasons could apply to the cycle of life: heartbreak and healing; suffering and blessings; growth and stagnation could be better understood by appreciating the differences between winter, summer, fall, and spring. It was through writing that I was able to grasp these more complex thoughts – not necessarily in a single writing session, but over the span of a few months, a year or several years. I wrote about everything: questions, answers, random thoughts that popped into my mind while driving home one night, fears, aspirations, love, lust, passion, mysteries and my desire to solve them all. I wrote letters to people I’d never send, I expressed my feelings of gratitude and joy when I felt them, and I wrote through my sadness and worries in a way that encouraged me to understand and wrestle with those emotions. In many ways, just the simple act of writing felt like unraveling a hairball of ideas, emotions and words in my mind; that’s where I found medicine in ink. I have learned that perhaps even more healing than the writing, however, is the process of reading through phases of my life and reflecting on my own experiences from a place of greater maturity and wisdom. It’s the process that empowers me to witness the lessons I have learned, the questions I had once fiercely grappled with that I no longer do, and the ways in which I had transformed as a person from one phase of my life to the next. When enough time has passed and one looks back on their writing, it’s like observing oneself from an entirely different perspective. For me, past writing serves as evidence that I have completely outgrown a phase when I’m able to reflect back with a high degree of impartiality. In those moments, I’m able to understand my thought process in that time as if I were observing a younger sister, a daughter or a friend. It is reassuring and restorative in its own way to see one’s own process of growth and transformation play out between the lines of paper. When I look back over my writing, whether I was in preadolescence or an eighteen-year-old woman grappling with thought-provoking concepts, it’s compelling to witness the phases of my life and how they all connect together figuratively but also in a literal sense – woven together with a line of ink. It helps me form a solid sense of self-awareness that is rooted in a foundation of words written in genuine, raw moments of life. The mind tends to reflect on memories from the perspective of the present moment. Therefore, it’s difficult to contemplate who one really was in any given moment and to observe how one’s thoughts have changed over time. Human beings are dynamic; we change the way a riverbed transforms into a canyon over time due to the force of the water. If there’s no documentation of that journey from one point to the next, how do we fully understand our experiences and ourselves? I have come to learn that writing is the most genuine, organic form of documentation of a single life. Now that I fully grasp the significance of the advice my mother gave to me at a young age, I now hope to pass that advice on to others. For the person who feels stable, to the one searching for a sense of self, the one grappling with depression or anxiety, the person overcoming hardship, the one experiencing bliss and for the child navigating the unknown: writing may not be your cure, but I promise you that pen and paper will prove to be a friend, a therapist, or maybe just a deeper relationship with yourself. Samantha Case is a recent graduate from the University of Wyoming with a Bachelor’s degree in Gender & Women’s Studies. In early 2017, she launched Wyoming Women Rise, a nonprofit organization to encourage women in Wyoming to run for public office. Samantha works full-time for WyoFile, a nonprofit dedicated to in-depth reporting of issues critical to Wyoming and its people. On her free time, Samantha enjoys fleeing for the woods, traveling and writing poetry and narrative essays. She shares her writing on her website www.samanthacase.com and on Instagram under the username samcasee.